MOST offers superior training programs designed to increase the skills and knowledge levels of Boilermakers. The end result is a well-qualified, safe, responsible and drug-free workforce for our Owners and Contractors. 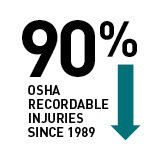 OSHA recordable injuries have decreased by 90% since 1989. Classes are offered at training facilities nationwide. Please contact the Local holding the class listed below for availability or questions. For general inquiries, contact the MOST office at (913) 281-5036. Please note: Generic, construction-focused versions of the OSHA 10 Hour class and OSHA 30 Hour class are now available as online courses. Contact Nikki Benson (913-281-5036, x317) in the MOST office for more information and to enroll. A highly skilled craft begins with quality training. Classes include: Construction Safety & Health 10 Hour, Field Leadership Training, MOST 5 Hour Refresher, MOST Project Management, OSHA 30 Hour Completion, OSHA 500 Train-the-Trainer, OSHA 510 Standards, Scaffold Users, Steel Erection and Rigging Fundamentals, Supplementary Rigging Modules 1 – 4 and The Boilermaker Code. Click below to see more information on individual classes. Attention Construction Boilermakers: Click here to update your participant information. There are no classes scheduled this month for the selected training course. Construction Safety & Health OSHA 10-Hour teaches job applicants to identify hazards in the workplace and how to protect themselves from those hazards. This course also familiarizes job applicants with OSHA standard requirements and explains Employee/ Employer Rights and Responsibilities. We are pleased to announce that online safety training for the OSHA 10 Hour is now available and is provided by Red Vector. Please contact Nikki Benson at 913-281-5036 ext. 317 for information and to enroll. The Field Leader Train-the Trainer class is a two-day class comprised of Boilermakers and Contractor representatives. Potential instructors will be evaluated during this class to ensure they can present the course material. The participants should have prior instructor experience, be willing to travel to teach future classes on the local level, and be respected by their peers. Contractor participation is essential for the credibility and success of this program. Not only for the Train-the-Trainer class, but for continued involvement/instruction on the local level. Please encourage any contractor representative that is interested to register for this training. MOST offers a 5 Hour Refresher that touches on the following topics: introduction to OSHA, personal protection and training, confined space, fall protection – OSHA Subpart M, scaffolding – OSHA Subpart L, electrical safety – OSHA Subpart K and occupational health and hazard communication – OSHA Subpart D. While this course that is not recognized by OSHA, it is recognized by some Contractors and Owners, and can be a jobsite requirement. The training is noted on the MOST Boilermaker Delivery System and works in conjunction with the Uniform Referral Standards and Joint Referral Rules. The Project Management Program trains qualified Boilermakers on how to manage projects for our signatory contractors in a business-like manner, make decisions that positively impact project goals and provide an overall benefit to the union, Contractors and Owners. This weeklong class is designed to teach upper management skills. As such, applicants with extensive supervisory experience are encouraged to apply. OSHA 30 Hour Completion teaches job applicants to identify hazards in the workplace and how to protect themselves from those hazards. This course continues to familiarize job applicants with OSHA standard requirements and explain Employee/Employer Rights and Responsibilities. NOTE: For members interested in any OSHA 30 Hour Class – the SAME trainer must do ALL the training and ALL the training must be completed, start to finish, within six (6) months. Also, MOST is pleased to announce online safety training is now available for OSHA 30 Hour and is provided by Click Safety. Please contact Nikki Benson at 913-281-5036 ext. 317 for enrollment. To teach any MOST Safety class, prospective trainers must complete the OSHA 500 Train-the-Trainer course through MOST. This course is one of four requirements for all NEW instructors. The other three requirements include completion of the OSHA 510 Standards and the Construction Safety & Health 10-Hour, and submit proof of five (5) years of construction safety and health experience. Students work in groups to develop presentations and present their work. Personal computers with PowerPoint and a memory stick are encouraged. To become a MOST Trainer, members must complete the OSHA 510 Standards. The five-day class is mandatory for all NEW instructors. Other requirements include the OSHA 500 Train-the-Trainer course, the Construction Safety & Health OSHA 10-Hour course, and proof of five (5) years of construction safety and health experience. Students work in groups to develop presentations and present their work. Personal computers with PowerPoint and a memory stick are encouraged. The Scaffold Erector/Dismantler is a one-day erection and dismantling class. This class is a hands-on lab for systems, tube & coupler or suspended scaffolds. There is no classroom time involved – only the actual scaffold erection and dismantling. The Scaffold User class is a pre-requisite. The Scaffold User course covers a general overview of OSHA Subpart L including scope, application, definitions, general requirements and training requirements. It also reviews additional requirements for tubular welded frames, mobile tower systems, tube and coupler, suspended and tank builder’s scaffolds. Steel Erection & Rigging Fundamentals covers a general overview of OSHA Subpart R including fall hazard training, multiple lift rigging procedures, connector procedures and rigging fundamentals. This is a two-day training class for new trainers. Requirements include completion of all four (4) modules. This module will explain the responsibilities of a rigger and help the student to become familiar with various rigging components. Students learn the inspection criteria for rigging components, where the first signs of wear and defects occur, and how to prevent damage to rigging components. Additionally, you’ll learn how to interpret rigging capacity charts and tables related to rigging tools. Trainers discuss safety regulations, uses and applications of rigging components. This module addresses a number of rigging topics including rigging without a crane, alternative hoisting equipment, tugger hoisting techniques, anchorage/attachment, high lines, and block and tackle systems. Additionally, you will be instructed on the basic scientific rigging terminology, fleet angle, mechanical advantage, transfer of loads, planning steps, related calculations, structural nomenclature and safety regulations. Module 3 focuses on the crane – understanding crane nomenclature, the different types and lifting systems, proper boom assembly/disassembly, safety regulations and how to spot and set up a crane. The class also covers how to read capacity charts, signaling, utilizing suspended personnel platforms, good safety and skills practice, accidents and preventative solutions. Discussions about OSHA regulations, Subpart CC-signal person qualification and the review of comprehensive rigging plans will be covered. The final supplementary rigging training module provides instruction on rigging drawing and interpretation, calculating equalization and load distribution. It illustrates how to determine a loads center of gravity and calculate its weights. Additionally you will learn how to use reference materials, understand the logistics and structuring of a material lay down area, set up a fabrication area and maintain it, and inspect/document/track materials. The Boilermaker Code training offers an in-depth look at how our actions have a direct impact on future Boilermakers. This 10-module training course focuses on our past, examines the economic impact and impressions of negative actions, and explores the reality of the current marketplace. 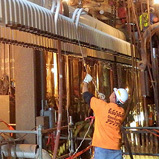 Its objective is to empower Boilermakers to be leaders on our job sites and help others reach the ultimate goal of living The Boilermaker Code each day.